LB138, sponsored by Bellevue Sen. Carol Blood, would authorize the state Department of Motor Vehicles to create several specialty license plates including designs honoring people who have served in the armed forces in Iran, Afghanistan, the Persian Gulf War and the Vietnam War. It also would create a “Support Our Troops” plate available to those who have not served, but would like to show support for the armed forces. “The [“Support Our Troops” license plate] is designed to not only show support for our troops, but also to generate revenue that will increase our efforts to recruit this highly skilled workforce to stay and work here in Nebraska upon retirement,” Blood said. A Transportation and Telecommunications Committee amendment, adopted 35-0, would add a fifth license plate design honoring those who have served in the Global War on Terror. There would be a $5 fee for any of the bill’s specialty alphanumeric plates and a $40 fee for a personalized message plate. The alphanumeric fee and $30 of the personalized message fee would be dedicated to the Veterans Employment Program Fund. The remaining portion of the personalized message fee would be credited to the DMV cash fund. The specialty plates would be available effective Jan. 1, 2021. The committee amendment also incorporated provisions of LB696, originally introduced by Brainard Sen. Bruce Bostelman, which would substitute Army National Guard and Air National Guard license plates for the current National Guard Military Honor plates. Provisions of LB697, introduced by Bostelman, also were incorporated under the committee amendment. These would eliminate application and renewal fees for Purple Heart, ex-POW, Pearl Harbor Survivor and Disabled American Veteran license plates effective Jan. 1, 2021. Similarly, there would be no application fee for a Gold Star personalized message license plate, however a $5 renewal fee still would apply. The license plate would be considered permanent as long as the vehicle to which it is attached remains registered by the applicant. “A modest [fee revenue] gain … should not outweigh the policy of recognizing and supporting these veterans and their families and one way to do this would be to allow these plates to be available to such individuals without a fee,” Bostelman said. The committee amendment also would have reduced the application fee for a “Support Our Troops” license plate from $70 to $40; however, Blood introduced an amendment to maintain the $70 application fee outlined in her original bill. She said a higher fee for the plates was justified because the funds raised would go to support an important cause. “We’ve seen that people are more than willing and are eager to purchase plates for $70 if they are for a cause that they support,” Blood said. Bennington Sen. Wendy DeBoer spoke in support of the Blood amendment. She initially voted for the fee decrease as a member of the committee, she said. Opposing the fee increase was Peru Sen. Julie Slama. She said she was concerned that the $70 fee would be unaffordable to people wanting to show their support. The Blood amendment was adopted 35-6. 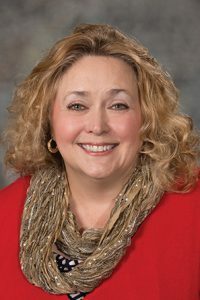 Lincoln Sen. Patty Pansing Brooks introduced an amendment that would incorporate provisions of her LB626, which would direct the state Department of Veterans Affairs to create a job search website specifically for veterans. The provisions of the Pansing Brooks amendment would be funded through revenue raised by sales of the “Support Our Troops” license plates. Pansing Brooks said she met with veterans who believe that neighboring states are doing a better job of direct outreach to veterans and service members who might wish to stay in Nebraska. 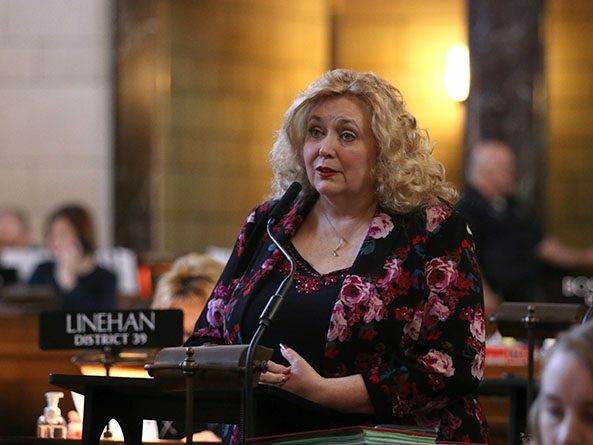 “I believe that this [amendment] acts as a beacon to veterans and transitioning service members, welcoming them to Nebraska and acknowledging the fact that we want them here so that they can become vital members of our workforce,” she said. La Vista Sen. John Arch expressed concern about using license plate revenue to fund an ongoing state program. “My concern is that if we start something with special funding … and for whatever reason enough plates are not sold, then suddenly we’re back to the general fund to maintain the website and keep the program going,” he said. After adopting the Pansing Brooks amendment 31-0, senators voted 37-0 to advance the bill to select file.